Photo thanks to: Philipp Peterer. The Mount Carmel Caves are four cave sites that testify to more than 500,000 years of human evolution. 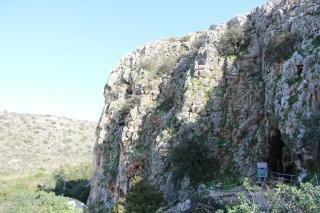 They are situated on a cliff in the Mount Carmel range. They were first excavated in the 1920s and 1930s. For those who have no background of prehistory, these caves can be disappointing. Well, not even caves, because only one of four (Nahal) can be called a cave; the three are rather shelters or holes in the natural cliff façade (the ceilings, first floors of the karst caves collapsed thousand years ago and paradoxically saved remains of our ancestors’ culture). But if you are able to stimulate your imagination and go far back half a million years ago… And if there’s a guide who can explain what you’re looking at… The outstanding value of this site becomes clear and unquestionable. This is the most exiting journey through human (pre)history you can experience, although not many traces are left. a. Tabun. The face of this “cave” is is viewed from an observation point at a distance of some 15 metres and I found it to be the most interesting as it possesses a well exposed series of archaeological strata covering around 150k years which are nicely identified and explained via a series of markers (photo) next to an explanatory board. Only here will you get a real feeling for the passage of time across all the cultures which used the site. It was in this cave that Neanderthal remains were found - prompting debate about the nature of their concurrent existence with Homo Sapiens Sapiens. b. Gamal. A shallow cave which has been used to display a series of slightly pathetic models of “early humans” and some of their foods from the Mousterian period - strictly for the “kids” I think! c. Nahal. 70 metres deep with a nice exposure of the limestone reef from which the caves were eroded. At the back, an audio-visual dramatization of the humans who lived in the caves is played at fixed times. Again I think this was primarily aimed at kids. But weren’t 4 caves inscribed? Indeed, but I had to ask at the Visitor Centre where the 4th was as it receives no mention in the flyer they had handed out. 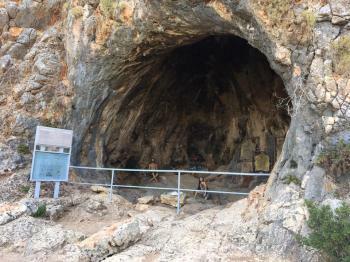 This is the Skhul Cave which lies outside the caged area and is reached by walking 200 metres or so up the valley behind the Centre and climbing a short path behind an electricity sub station (it is signed in Hebrew!). This is hardly a cave at all – rather a small overhang but is where perhaps the most significant findings were made in the form of “purposeful burials” (the earliest discovered anywhere in the World to date?) of 7 adults and 3 children, some with shell ornamentation, dating back around 80-120k YBP. 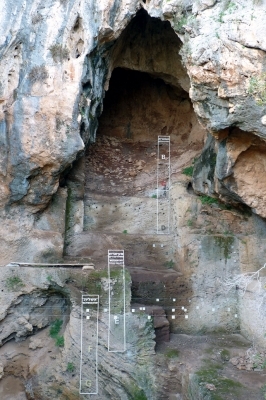 A copy of a skeleton, arranged as it was found, has been placed near Nahal Cave (ie inside the “cage”!) but 2 originals are on display at the Rockefeller Museum in Jerusalem. The skeletons exhibit some archaic traits and are the subject of much debate – do they represent Neanderthal hybridization or perhaps the second exodus of man from Africa which is now thought to have taken place through Israel. In any case, although there is nothing to see at the cave itself, it was nice to have seen the location where these remains were discovered, together with the originals in a museum. The Carmel caves are an easy WHS to tick off. They are conveniently located close to route 4 and make a nice stopover when travelling between the WHS of Tel Aviv and Haifa. As for all fossil sites, don't expect to see much. There are a few descriptions, a few stone age tools, a film and in one of the 3 visible caves some puppets, recreating the live in the cave. But the landscape is nice and the caves are really easy to reach. You can enter one of them; the others are seen from the outside. About half an hour should do it to visit the site. The Carmel caves are the only site where both Homo Sapiens and Neanderthals have been found side by side. Despite its historical significance there is really not much to see for the casual visitor. Access is only in guided tours where you get explained about the history of the digging and can watch a film about how people lived in these caves. The entire tour takes about half an hour. Most interesting findings like bone jewelry and stone utensils are on display in the small museum of prehistory in the nearby city of Haifa (where you can also visit the WHS Bahai Gardens). "Cave Man" sites: "The caves of Tabun, Jamal, el-Wad and Skhul. Ninety years of archaeological research have revealed a cultural sequence of unparalleled duration, providing an archive of early human life in south-west Asia. This 54 ha property contains cultural deposits representing at least 500,000 years of human evolution demonstrating the unique existence of both Neanderthals andEarly Anatomically Modern Humans within the same Middle Palaeolithic cultural framework, the Mousterian. Evidence from numerous Natufian burials and early stone architecture represents the transition from a hunter-gathering lifestyle to agriculture and animal husbandry"
Reduced from broader TWHS: TWHS originally included Shaar HaGolan and Ovadia. 72 Community Members have visited.